Deaf participants in NASA's and the U.S. Naval School of Aviation Medicine's joint weightlessness research program sit in a zero-g aircraft that flew out of Naval Air Station in Pensacola, Florida. The program ran from 1958 to 1968. A new museum exhibit honors 11 men who made significant contributions to spaceflight in NASA's early days. 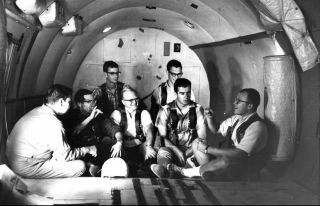 In the late 1950s, NASA recruited 11 deaf men from Gallaudet College (now Gallaudet University) to study the long-term effects of weightlessness on the human body before the agency ultimately sent astronauts to space. The group of men, also known as the "Gallaudet 11," suffered from inner-ear problems. As a result, they did not experience the adverse effects of motion sickness, making them the perfect candidates for early spaceflight experiments, according to a statement from NASA. John Zakutney, a participant in joint weightlessness research from NASA and the U.S. Naval School of Aviation Medicine, is lowered down into a centrifuge pod. "Throughout a decade of various experiments, researchers measured the volunteers' non-reaction to motion sickness on both a physiological and psychological level, relying on the 11 men to report in detail their sensations and changes in perception," NASA officials said in the statement. From 1958 to 1968, the men participated in various weightlessness, balance and motion-sickness experiments that helped NASA scientists better understand how the human body responds to foreign gravitational environments. For one of the experiments, four men spent 12 straight days inside a slow-rotation room to test the effects of gravitational changes on the human body. Other experiments included zero-gravity flights in the "Vomit Comet" (an airplane that simulates the feeling of weightlessness that astronauts experience in space) and ferry rides on choppy seas off the coast of Nova Scotia, according to the statement. "These experiments help to improve understanding of how the body's sensory systems work when the usual gravitational cues from the inner ear aren't available, as is the case of these young men and in spaceflight," NASA officials said in the statement. The Gallaudet 11 included Harold Domich, Robert Greenmun, Barron Gulak, Raymond Harper, Jerald Jordan, Harry Larson, David Myers, Donald Peterson, Raymond Piper, Alvin Steele and John Zakutney. The Deaf Difference + Space Survival exhibit is currently on display at Gallaudet University's Jordan Student Academic Center. Follow Samantha Mathewson @Sam_Ashley13. Follow us @Spacedotcom Facebook and Google+. Original article on Space.com.